TGIF, dear readers! It has been a BUSY week around here, both on the blog front and with my family, so I am looking forward to getting a little relaxation in somehow over the next few days. I'm hoping to head to the beach for a couple hours and am crossing my fingers the weather is cooperative. It's never particularly relaxing with two little boys in tow, but I might be able to get them to sit down for a picnic lunch at some point. Here's hoping, at least! Now on to today's blog post! 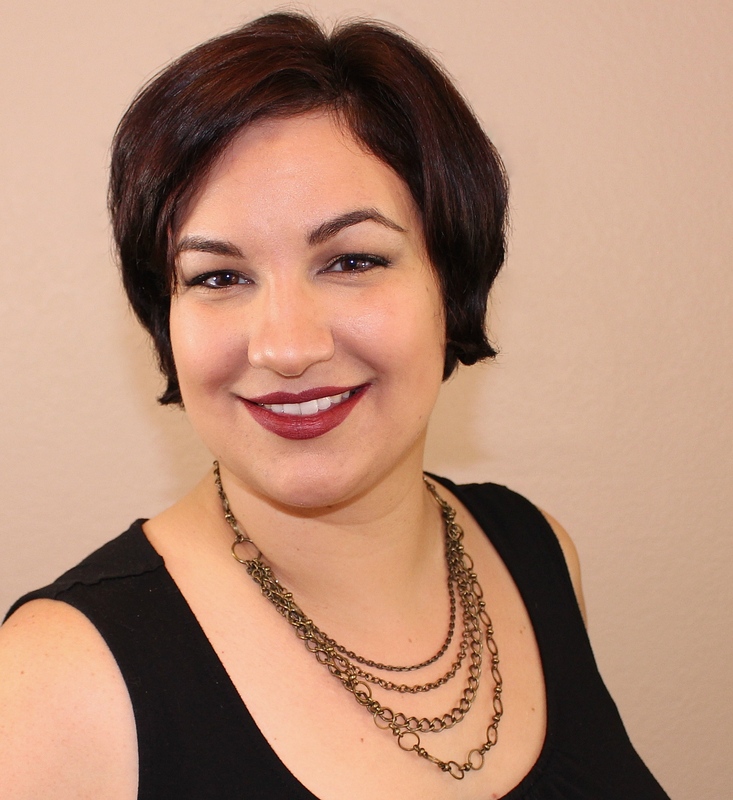 For today's blog post, I wanted to share with you a fabulous beauty find from last month's Cosmoprof North America. 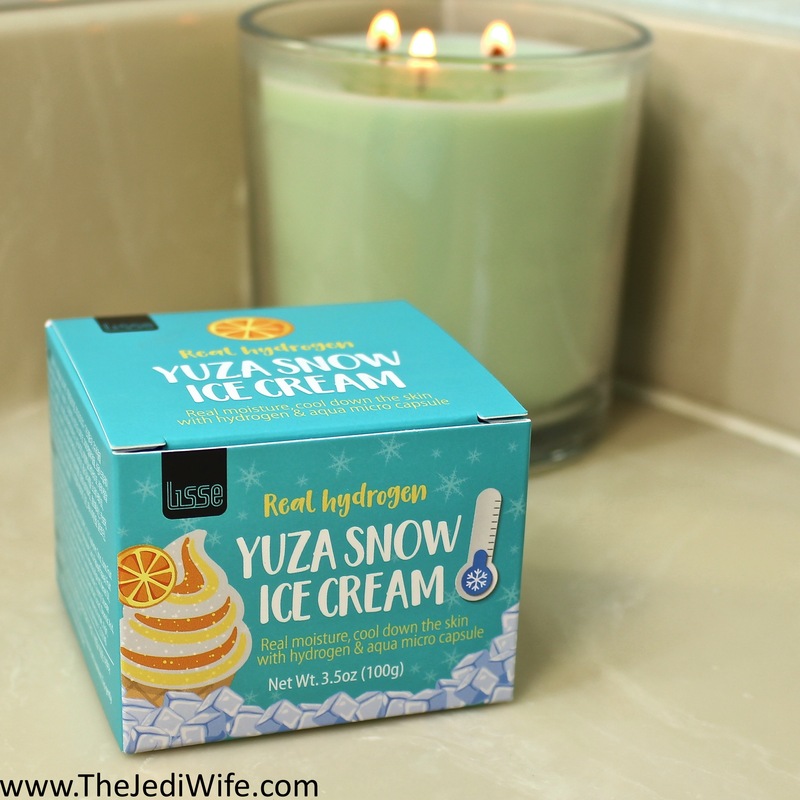 I had the pleasure of visiting with numerous Korean Beauty brands, and one of the products that really stuck out to me is the Lisse Real Hydrogen Yuza Snow Ice Cream. Rather than an ice cream meant for consumption, the Yuza Snow Ice Cream is a cooling cream that is meant to be applied to the skin. This intriguing product utilizes hydrogen water to remove toxic waste from the skin and adds moisture to skin. It also contains aqua micro capsules that burst upon the tapping application onto your skin, resulting in a true cooling sensation as your skin temperature is actually lowered. Rather than mint products that give the illusion of a cooling effect, the Yuza Snow Ice Cream is the real deal on that front! In addition to hydrogen water and aqua micro capsules, the Real Hydrogen Yuza Snow Ice Cream obviously contains yuza extract. Yuza contains three times the vitamin C as lemons and 22 times the vitamin C found in apples; needless to say, yuza is an excellent source of this vitamin! Vitamin C is well known to tighten pores, brighten skin tone, and restore elasticity to the skin. It also contains their patented formula for Evermat to tighten pores, reduce shine, and provide sebum control. Papaya extract and grapefruit peel oil are also included to remove dead skin cells and leaving your skin feeling smoother. With all these quality ingredients, I was certainly looking forward to testing out this product! The Lisse Real Hydrogen Yuza Snow Ice Cream is applied to the skin after you have already washed your wash and applied you usual toner and moisturizer. Because this product already has a moisturizing effect and my skin does not always agree with extra layers of products over the hot summer months, I tested this out both with an without my normal lightweight gel moisturizer. My skin felt about the same to me regardless of which method I used, so I continued to apply my moisturizer first for subsequent tests. The Real Hydrogen Yuza Snow Ice Cream is packaged in a 3.5oz/100g screw-lid jar and comes with a small plastic spoon for scooping. Once you open the jar, there is a light plastic barrier between the lid and product. It is not sealed to the jar and serves to keep pressure on the product so it remains in the jar rather than spreading all over the lid, especially during transit. I removed this layer and scooped the product with the included spoon before removing it with a clean finger and spreading it evenly over my face. I then followed up with tapping my fingers across my face to pop the aqua micro capsules and cool my skin down. 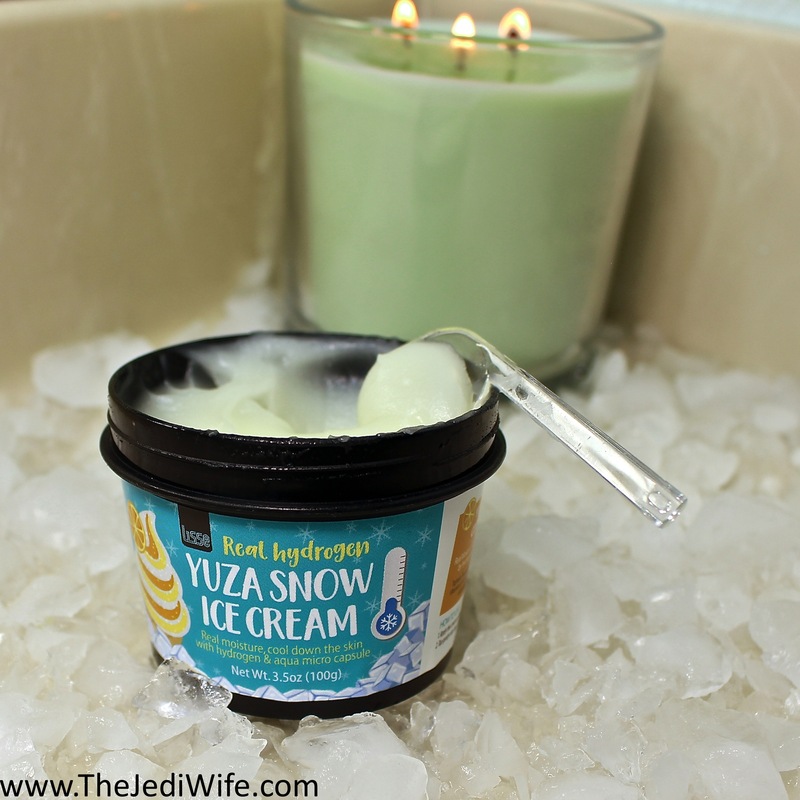 I have really enjoyed trying out the Lisse Real Hydrogen Yuza Snow Ice Cream! It applies easily to the skin, and I suspect the cooling effect has helped to keep my makeup in place over the hit summer days. Because of all the ingredients, it isn't exactly scent-free, but scent is light and fresh, even for my ultra-sensitive nose! I generally can't wear a lot of scented products on my face just due to smell alone, so if you're like me, you likely won't mind it unless you don't care for the scent of yuza. I did appreciate that it can with its own scooper so I'm not inadvertently introducing my normal facial bacteria to the product and causing it to spoil or have contamination issues. While this can be stored at room temperature, something I will be doing in the cold winter months, it can be stored in the refrigerator for an extra cooling sensation for application. I have applied this product pulled from both storage conditions, and I certainly could appreciate the extra cooling on our really hot days this summer! It still has a cooling effect even at room temperature although it is more subtle. Ultimately how you choose to store it will come down to your own personal preference. The Real Hydrogen Yuza Snow Ice Cream can be purchased from the Lisse website located hereThe retail price is $29 for 3.5oz (100g). Have you previously heard of the Lisse Real Hydrogen Yuza Snow Ice Cream? Is it a product that you would be interested in trying? I'd love to hear your thoughts about this innovative K-Beauty product! This stuff sounds awesome!!! I bet it would feel great if you got a sunburn too. I'm going to check a loca plate that carries a lot of Asian brands and see if they have it! I absolutely love the cute packaging and little ice cream spoon. 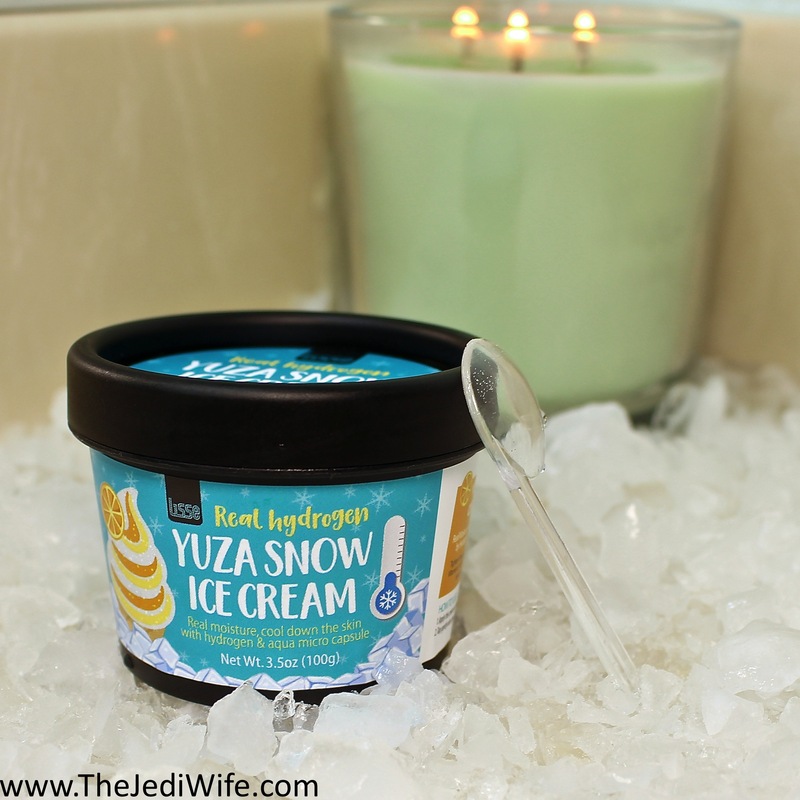 Yuza Snow Ice Cream is such a unique beauty product. I want to try this ASAP! I like the name Snow ice cream it's very catchy. Soothing cooling sensation sounds very inviting. Oh my gosh, yes please! I just love the name of this. I'm intrigued and would try it! Seems like a really nice product, I like Asian products and will check my local for this one. This sounds like a really interesting product, K products always really tempt me to try them I have to admit. I think I would buy it for the packaging alone! Sounds like an awesome product. Korean beauty products are popular now! They have a great result and affordable. I love your list of those! I have CPNA sunscreen and I love it! I got it a few years ago in Memebox, which used to be a subscription box back then. This looks like a rad product! I'm going to have to hunt down a jar for myself. I have tried a handful or Korean skincare but have never heard of Lisse! Sounds like a fantastic product. I've never heard of this product! It looks wonderful... I'll definitely be checking into it! It sounds like such an interesting product here. I have never heard of something like this for skin care but it does sound like it would feel better. I was so confused at first! I am looking for an after sun product and this came up in my search. Ice cream? Wait..what? Ice cream for the skin. LOL! I am sold just due to the packaging. Lisse Real Hydrogen Yuza Snow Ice Cream sounds like a great skin cream. I would love to give it a try. I love the name. This cream sounds very refreshing and a good product. I hope I can get a chance to try it. Thanks for sharing. This product sounds amazing. I hope I can try it out sometime. Oh my gosh what a fascinating product! I love a good face mask, so I'm sure I'd love this - especially in summer! This is something that I feel like would really help my skin. I love that it uses hydrogen water and is applied after you wash.
What a novel product! When I first saw the picture I thought it was literally something you could eat! This would be great in the hot, humid summer months. Wow this product looks awesome! I'm always looking for products to better my skin! I'll have to check this one out! Thanks for sharing! Wow I love that the Yuza Snow Ice Cream helps take toxins from the skin while also adding hydration. I have dry skin so this is something I'm definitely going to be checking out and trying for myself. Wow! This looks pretty awesome. I have never heard of cpna beauty lisse real hydrogen yuza before. It sounds like it works really well for impproving the kids. I am intrigued by this product! I bet it could do wonders for my skin.